Well, this year the Spode will be spending another lonely year boxed up in the garage, and we'll be eating on paper plates! Every Christmas, my mother-in-law has given me a Wallace silver sleigh bell. I've been married for twenty years, so, yes, I have twenty of these beautiful silver bells! I just love the silver finish, and you know what I like even better? They make a fabulously easy Christmas decoration! How's your holiday decorating coming along? What - your kids weren't excited about countertops? LOL! I really love the red and white dishes! I think they are just as Christmas-y as the Spode! The cabinet looks gorgeous! I like your snowflake and silver bell look. My decorating is coming slowly. Not sure what my problem is this year, but I feel so behind and so uninspired. I need to watch a good Christmas movie to get me in the mood. Have fun with the kitchen. It will be so worth it when it's all done. Oh, and I love the Christmas header! The funny thing is that although I liked the cabinet with the Spode, I like it even better this way. Very pretty and I love your holiday header. I like the cabinet better this way too! So beautiful. Love the idea of getting those silver bells every Christmas. That's sweet! I think your kids' reactions were about as favorable as ours! Although Tori is pleased with her little pull out drawer to store her favorite snacks. Love the simple elegance of the corner shelf display. I am still decorating here in East Tennessee!!! your cabinet looks adorable! Those silver bells are fabulous! Lucky girl that you have such a wonderful MIL! Hope things are going well on your renovation! Heather I love the red and white in your cabinet with the greenery mixed in. Beautiful! oh - the red & white is festive with the addition of the bells & snowflakes. Oh kids! I think your cabinet is very festive!!! I can't believe the kids didn't want a new stove or counter tops for Christmas!!! I love the red n white dishes! Your little cabinet looks great....have fun with the kitchen project,,,can't wait to see pictures!! I can't believe that our kitchen reno is almost a year ago...we started reno on Jan 3rd!!! Beautiful! I love the plates and they look so festive with the snowflakes. Heather! Your cabinet is beautiful and I'm in love with those gorgeous bells. What a wonderful gift! I'm excited to tell you that you've won the giveaway on my blog. I emailed you, but if for some reason you didn't get it, let me know on my blog or facebook page! Believe it or not every season I look forward to seeing what you will do to your pretty corner cabinet. I know that a kitchen remodel can be all consuming but I'm glad you were able to decorate your cabinet...It looks beautiful. Love the silver bells. windows over the sink! Love the size and style. from a can and a new sink. what a wonderful keepsake..your dishes, adorable. Your china makes me drool. A. Love the corner cabinet. B. Really love your red and white dishes. C. Drooling over the sleigh bells. Thanks so much for visiting my blog today. And now, I'm going to go read about your kitchen remodel. I glanced at the pics quickly and your ceiling caught my eye so need to explore further. Nice meeting you! I'm now a follower. Those red and white dishes are just yummy! They're perfect for X-mas and very versatile for the rest of the year as well. Hi Heather! I've missed you! Thank you for stopping by and leaving a sweet comment today! 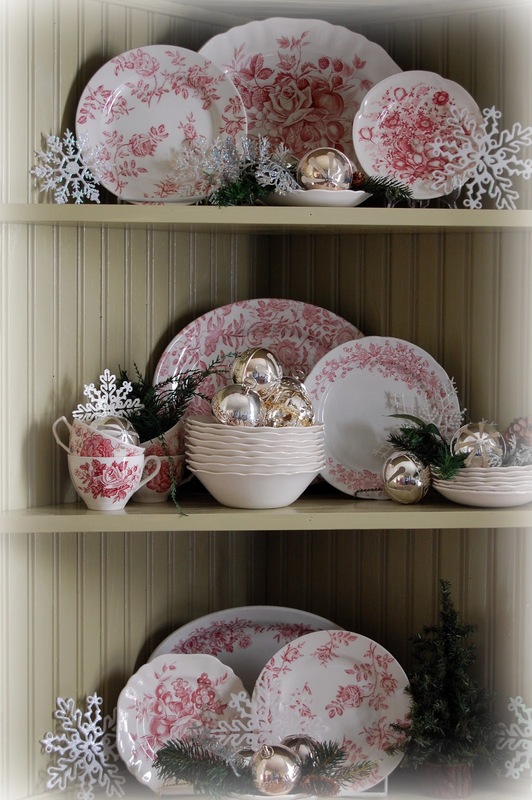 Your corner cabinet looks so festive and beautiful. I am so excited to hear more about your kitchen remodel! Clearly your kitchen has great bones, and you have wonderful taste so there is no denying it's going to be fabulous! I remember my great grandma's "bathroom kitchen." Funny, I hadn't thought much about it before! I hope all is well with you and your family. Best of luck on the remodel! I'll be anxiously awaiting updates! glad you stopped by, those glittered stars are gift tags from Target! I buy tags I like and use them in decorating and also hang them on my tree. Hope you are having a great Holiday season so far! I love your header! and your corner looks very "Chritmas" very pretty; How is the kitchen going on? i am late for my decorations as i have got flu! Love the hutch with the bells and the china. So subtle but so Christmasy. Looking forward to more kitchen posts. My mom wasn't happy either when I told her that my gift for her for Christmas was me moving out. I guess we always want gifts we actually really want.